One of the main goals of the Learning Layers project is to develop technologies that support informal learning in the workplace. Acknowledging the shift of Information seekers’ culture from the standard desktop interface towards an approach of a personal smart device, which is immediate, embodied and social has been crucial for the project. The smart mobile or wearable device have proven to have many advantages as an interface that connects the digital and physical world, one of them being an interface for an Augmented Reality (AR) layer. With this Social AR tool workers can relate to an issue in their physical work environment and share it remotely and immediately with their peers by using the Social AR interface. By attaching a layer of personal observation on top of a live video recording of the physical objects of interest, they can directly and efficiently clear a doubt, solve a problem, warn about safety, create instructions or communicate a proposal. The Social AR is work in progress. LeGroup developed a proof of concept of the Social AR video calling features in February 2014. 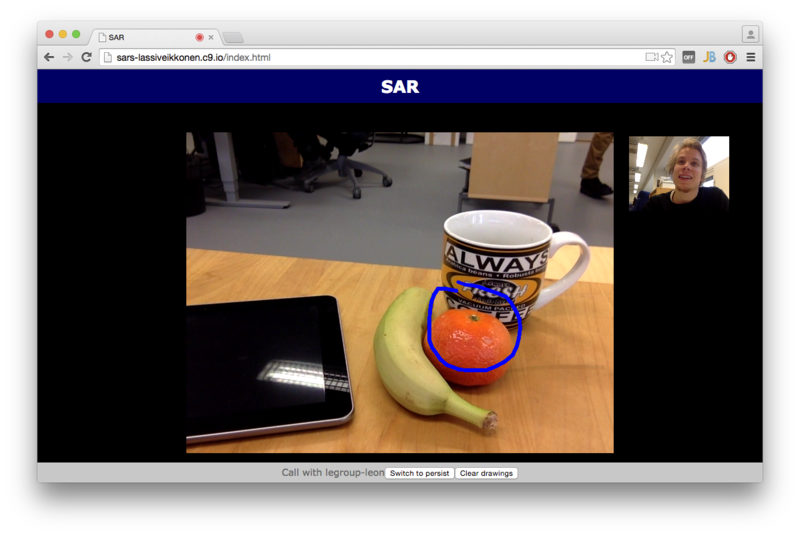 The web-based prototype implements a peer-to-peer video call using WebRTC and augments it with a bi-directional drawing layer. Both participants can draw on either video, and the view will automatically change to the video that’s being drawn on. The proof of concept also works on mobile platforms and performs well on modern devices. Even better responsiveness and performance could be achieved by a native application.